Theropoda (/θɪəˈrɒpədə/ or /ˌθɪərəˈpoʊdə/, from Greek θηρίον "wild beast" and πούς, ποδός "foot") or theropods (/ˈθɪərəˌpɒdz/) are a dinosaur suborder that is characterized by hollow bones and three-toed limbs. They are generally classed as a group of saurischian dinosaurs, although a 2017 paper has instead placed them in the proposed clade Ornithoscelida as the closest relatives of the Ornithischia. Theropods were ancestrally carnivorous, although a number of theropod groups evolved to become herbivores, omnivores, piscivores, and insectivores. Theropods first appeared during the Carnian age of the late Triassic period 231.4 million years ago (Ma) and included the sole large terrestrial carnivores from the Early Jurassic until at least the close of the Cretaceous, about 66 Ma. In the Jurassic, birds evolved from small specialized coelurosaurian theropods, and are today represented by about 10,500 living species. The majority of theropod teeth are blade-like, with serration on the edges, called ziphodont. Others are pachydont or phyllodont depending on the shape of the tooth or denticles. The morphology of the teeth is distinct enough to tell the major families apart, which indicate different diet strategies. An investigation in July 2015 discovered that what appeared to be "cracks" in their teeth were actually folds that helped to prevent tooth breakage by strengthening individual serrations as they attacked their prey. The folds helped the teeth stay in place longer, especially as theropods evolved into larger sizes and had more force in their bite. Tyrannosaurus was for many decades the largest known theropod and best-known to the general public. Since its discovery, however, a number of other giant carnivorous dinosaurs have been described, including Spinosaurus, Carcharodontosaurus, and Giganotosaurus. The original Spinosaurus specimens (as well as newer fossils described in 2006) support the idea that Spinosaurus is longer than Tyrannosaurus, showing that Spinosaurus was possibly 3 meters longer than Tyrannosaurus though Tyrannosaurus could still be taller than Spinosaurus. There is still no clear explanation for exactly why these animals grew so much larger than the land predators that came before and after them. Recent theories propose that theropod body size shrank continuously over a period of 50 million years, from an average of 163 kilograms (359 lb) down to 0.8 kilograms (1.8 lb), eventually evolving into modern birds. This was based on evidence that theropods were the only dinosaurs to get continuously smaller, and that their skeletons changed four times as fast as those of other dinosaur species. As a hugely diverse group of animals, the posture adopted by theropods likely varied considerably between various lineages through time. All known theropods are known to be bipedal, with the forelimbs reduced in length and specialized for a wide variety of tasks (see below). In modern birds, the body is typically held in a somewhat upright position, with the upper leg (femur) held parallel to the spine and with the forward force of locomotion generated at the knee. Scientists are not certain how far back in the theropod family tree this type of posture and locomotion extends. Shortened forelimbs in relation to hind legs was a common trait among theropods, most notably in the abelisaurids (such as Carnotaurus) and the tyrannosaurids (such as Tyrannosaurus). This trait was, however, not universal: spinosaurids had well developed forelimbs, as did many coelurosaurs. The relatively robust forelimbs of one genus, Xuanhanosaurus, led Dong Zhiming to suggest that the animal might have been quadrupedal. However, this is no longer thought to be likely. The hands are also very different among the different groups. The most common form among non-avian theropods is an appendage consisting of three fingers; the digits I, II and III (or possibly II, III and IV), with sharp claws. Some basal theropods (e.g. Herrerasaurus, Eoraptor) had four digits, and also a reduced metacarpal V. Ceratosaurians usually had four digits, while most tetanurans had three. The forelimbs' scope of use is also believed to have also been different among different families. The spinosaurids could have used their powerful forelimbs to hold fish. Some small maniraptorans such as scansoriopterygids are believed to have used their forelimbs to climb in trees. The wings of modern birds are used primarily for flight, though they are adapted for other purposes in certain groups. For example, aquatic birds such as penguins use their wings as flippers. The earliest and most primitive unambiguous theropods (or alternatively, "Eutheropoda"—'True Theropods') are the Coelophysoidea. The Coelophysoidea were a group of widely distributed, lightly built and potentially gregarious animals. They included small hunters like Coelophysis and (possibly) larger predators like Dilophosaurus. These successful animals continued from the Late Carnian (early Late Triassic) through to the Toarcian (late Early Jurassic). Although in the early cladistic classifications they were included under the Ceratosauria and considered a side-branch of more advanced theropods, they may have been ancestral to all other theropods (which would make them a paraphyletic group). 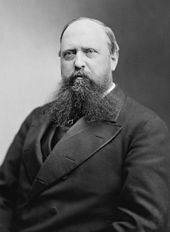 O. C. Marsh coined the name theropoda (meaning "beast feet") in 1881. Marsh initially named Theropoda as a suborder to include the family Allosauridae, but later expanded its scope, re-ranking it as an order to include a wide array of "carnivorous" dinosaur families, including Megalosauridae, Compsognathidae, Ornithomimidae, Plateosauridae and Anchisauridae (now known to be herbivorous sauropodomorphs) and Hallopodidae (subsequently revealed as relatives of crocodilians). 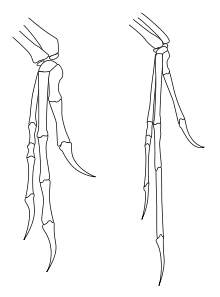 Due to the scope of Marsh's Order Theropoda, it came to replace a previous taxonomic group that Marsh's rival E. D. Cope had created in 1866 for the carnivorous dinosaurs: Goniopoda ("angled feet"). By the early 20th century, some paleontologists, such as Friedrich von Huene, no longer considered carnivorous dinosaurs to have formed a natural group. Huene abandoned the name "Theropoda", instead using Harry Seeley's Order Saurischia, which Huene divided into the suborders Coelurosauria and Pachypodosauria. Huene placed most of the small theropod groups into Coelurosauria, and the large theropods and prosauropods into Pachypodosauria, which he considered ancestral to the Sauropoda (prosauropods were still thought of as carnivorous at that time, owing to the incorrect association of rauisuchian skulls and teeth with prosauropod bodies, in animals such as Teratosaurus). In W. D. Matthew and Barnum Brown's 1922 description of the first known dromaeosaurid (Dromaeosaurus albertensis), they became the first paleontologists to exclude prosauropods from the carnivorous dinosaurs, and attempted to revive the name "Goniopoda" for that group, but other scientists did not accept either of these suggestions. Allosaurus was one of the first dinosaurs classified as a theropod. In 1956, "Theropoda" came back into use—as a taxon containing the carnivorous dinosaurs and their descendants—when Alfred Romer re-classified the Order Saurischia into two suborders, Theropoda and Sauropoda. This basic division has survived into modern paleontology, with the exception of, again, the Prosauropoda, which Romer included as an infraorder of theropods. Romer also maintained a division between Coelurosauria and Carnosauria (which he also ranked as infraorders). This dichotomy was upset by the discovery of Deinonychus and Deinocheirus in 1969, neither of which could be classified easily as "carnosaurs" or "coelurosaurs". In light of these and other discoveries, by the late 1970s Rinchen Barsbold had created a new series of theropod infraorders: Coelurosauria, Deinonychosauria, Oviraptorosauria, Carnosauria, Ornithomimosauria, and Deinocheirosauria. A large study of early dinosaurs by Dr Matthew G. Baron, David Norman and Paul M. Barrett (2017) published in the journal Nature suggested that Theropoda is actually more closely related to Ornithischia, to which it formed the sister group within the clade Ornithoscelida. This new hypothesis also recovered Herrerasauridae as the sister group to Sauropodomorpha in the redefined Saurischia and suggested that the hypercarnivore morphologies that are observed in specimens of theropods and herrerasaurids were acquired convergently. However, this phylogeny remains controversial and additional work is being done to clarify these relationships. ^ Holtz, Thomas R., Jr. (2012). Dinosaurs: The Most Complete, Up-to-Date Encyclopedia for Dinosaur Lovers of All Ages, Winter 2011 Appendix. ^ See analogous pronunciation of Gastropoda - definition of Gastropoda in English from the Oxford dictionary. ^ "Theropod". Dictionary.com Unabridged. Random House. ^ Zanno, Lindsay E.; Gillette, David D.; Albright, L. Barry; Titus, Alan L. (25 August 2010). "A new North American therizinosaurid and the role of herbivory in 'predatory' dinosaur evolution". Proceedings of the Royal Society B. 276 (1672): 3505–3511. doi:10.1098/rspb.2009.1029. PMC 2817200. PMID 19605396. ^ Longrich, Nicholas R.; Currie, Philip J. (February 2009). "Albertonykus borealis, a new alvarezsaur (Dinosauria: Theropoda) from the Early Maastrichtian of Alberta, Canada: Implications for the systematics and ecology of the Alvarezsauridae". Cretaceous Research. 30 (1): 239–252. doi:10.1016/j.cretres.2008.07.005. ^ Holtz, T.R. ; Jr; Brinkman, D.L. ; Chandler, C.L. (1998). "Dental morphometrics and a possibly omnivorous feeding habit for the theropod dinosaur Troodon". GAIA. 15: 159–166. ^ Hendrickx, C.; Mateus, O. (2014). "Abelisauridae (Dinosauria: Theropoda) from the Late Jurassic of Portugal and dentition-based phylogeny as a contribution for the identification of isolated theropod teeth". Zootaxa. 3759: 1–74. doi:10.11646/zootaxa.3759.1.1. PMID 24869965. ^ Hendrickx, Christophe; Mateus, Octávio; Araújo, Ricardo (2015). "A proposed terminology of theropod teeth (Dinosauria, Saurischia)". Journal of Vertebrate Paleontology (Submitted manuscript). 35 (e982797): e982797. doi:10.1080/02724634.2015.982797. ^ Hendrickx, C; Mateus, O (2014). "Abelisauridae (Dinosauria: Theropoda) from the Late Jurassic of Portugal and dentition-based phylogeny as a contribution for the identification of isolated theropod teeth". Zootaxa. 3759: 1–74. doi:10.11646/zootaxa.3759.1.1. PMID 24869965. ^ Geggel, Laura (28 July 2015). "One tough bite: T. rex's teeth had secret weapon". Fox News. Retrieved 1 August 2015. ^ "Special Serrations Gave Carnivorous Dinosaurs an Evolutionary Edge". ^ "Developmental and evolutionary novelty in the serrated teeth of theropod dinosaurs". ^ Göhlich, U.B. ; Chiappe, L.M. (16 March 2006). "A new carnivorous dinosaur from the Late Jurassic Solnhofen archipelago" (PDF). Nature. 440 (7082): 329–332. doi:10.1038/nature04579. PMID 16541071. ^ Goehlich, U.B. ; Tischlinger, H.; Chiappe, L.M. (2006). "Juraventaor starki (Reptilia, Theropoda) ein nuer Raubdinosaurier aus dem Oberjura der Suedlichen Frankenalb (Sueddeutschland): Skelettanatomie und Wiechteilbefunde". 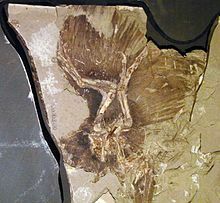 Archaeopteryx. 24: 1–26. ^ Therrien, F.; Henderson, D. M. (2007). "My theropod is bigger than yours...or not: estimating body size from skull length in theropods". Journal of Vertebrate Paleontology. 27 (1): 108–115. doi:10.1671/0272-4634(2007)27[108:MTIBTY]2.0.CO;2. ^ dal Sasso, C.; Maganuco, S.; Buffetaut, E.; Mendez, M. A. (2005). "New information on the skull of the enigmatic theropod Spinosaurus, with remarks on its sizes and affinities". Journal of Vertebrate Paleontology (Submitted manuscript). 25 (4): 888–896. doi:10.1671/0272-4634(2005)025[0888:NIOTSO]2.0.CO;2. ^ a b Borenstein, Seth (July 31, 2014). "Study traces dinosaur evolution into early birds". AP News. Retrieved August 3, 2014. ^ a b Zoe Gough (31 July 2014). "Dinosaurs 'shrank' regularly to become birds". BBC. ^ a b c d e Hutchinson, J.R. (March–April 2006). "The evolution of locomotion in archosaurs". Comptes Rendus Palevol. 5 (3–4): 519–530. doi:10.1016/j.crpv.2005.09.002. Archived from the original on 2008-12-01. ^ Paul, G.S. (1998). "Limb design, function and running performance in ostrich-mimics and tyrannosaurs". Gaia. 15: 257–270. ^ Farlow, J.O. ; Gatesy, S.M. ; Holtz, Jr.; Hutchinson, J.R.; Robinson, J.M. (2000). "Theropod locomotion". Am. Zool. 40 (4): 640–663. doi:10.1093/icb/40.4.640. ^ "Abstract", in Chure (2001). Pg. 19. ^ Dong, Z (1984). "A new theropod dinosaur from the Middle Jurassic of Sichuan Basin". Vertebrata PalAsiatica. 22 (3): 213–218. ^ See Origin of birds/Digit homology. ^ Some genera within Avetheropoda, however, had four digits, see University of Maryland department of geology home page, "Theropoda I" on Avetheropoda, 14 July 2006. ^ a b Senter, P.; Robins, J.H. (July 2005). "Range of motion in the forelimb of the theropod dinosaur Acrocanthosaurus atokensis, and implications for predatory behaviour". Journal of Zoology, London. 266 (3): 307–318. doi:10.1017/S0952836905006989. ^ a b Xing, L D; Lockley, M G; Zhang, J P; et al. (2013). "A new Early Cretaceous dinosaur track assemblage and the first definite non-avian theropod swim trackway from China". Chin Sci Bull. 58 (19): 2370–2378. doi:10.1007/s11434-013-5802-6. ^ Nesbitt, S. J.; Smith, N. D.; Irmis, R. B.; Turner, A. H.; Downs, A. & Norell, M. A. (11 December 2009). "A complete skeleton of a Late Triassic saurischian and the early evolution of dinosaurs". Science. 326 (5959): 1530–1533. doi:10.1126/science.1180350. PMID 20007898. .
^ Rowe, T., and Gauthier, J., (1990). "Ceratosauria." Pp. 151–168 in Weishampel, D. B., Dodson, P., and Osmólska, H. (eds. ), The Dinosauria, University of California Press, Berkeley, Los Angeles, Oxford. ^ Mortimer, M. (2001). "Rauhut's Thesis", Dinosaur Mailing List Archives, 4 Jul 2001. ^ Carrano, M. T.; Sampson, S. D.; Forster, C. A. (2002). "The osteology of Masiakasaurus knopfleri, a small abelisauroid (Dinosauria: Theropoda) from the Late Cretaceous of Madagascar". Journal of Vertebrate Paleontology. 22 (3): 510–534. doi:10.1671/0272-4634(2002)022[0510:TOOMKA]2.0.CO;2. ^ Ostrom, J.H. (1969). "Osteology of Deinonychus antirrhopus, an unusual theropod from the Lower Cretaceous of Montana". Peabody Museum Natural History Bulletin. 30: 1–165. ^ Dingus, L. and Rowe, T. (1998). The Mistaken Extinction: Dinosaur Evolution and the Origin of Birds. Freeman. ^ Lee, MichaelS.Y. ; Cau, Andrea; Naish, Darren; Dyke, Gareth J. (1 August 2014). "Sustained miniaturization and anatomical innovation in the dinosaurian ancestors of birds". Science. 345 (6196): 562–566. doi:10.1126/science.1252243. PMID 25082702. ^ Marsh, O.C. (1881). "Principal characters of American Jurassic dinosaurs. Part V.". The American Journal of Science and Arts. 3. 21 (125): 417–423. doi:10.2475/ajs.s3-21.125.417. ^ Matthew, W. D.; Brown, B. (1922). "The family Deinodontidae, with notice of a new genus from the Cretaceous of Alberta". Bulletin of the American Museum of Natural History. 46: 367–385. ^ Hendrickx, C.; Hartman, S.A.; Mateus, O. (2015). "An Overview of Non- Avian Theropod Discoveries and Classification". PalArch's Journal of Vertebrate Palaeontology. 12 (1): 1–73. ^ Baron, M.G. ; Norman, D.B. ; Barrett, P.M. (2017). "A new hypothesis of dinosaur relationships and early dinosaur evolution" (PDF). Nature. 543 (7646): 501–506. doi:10.1038/nature21700. PMID 28332513.